Making My 5th Doctor Costume: Chicago TARDIS - the fifth Doctor crew have landed! Having landed safely and on time yesterday afternoon, I am now refreshed after being awake for 25-hours straight and ready for what the convention has to throw at me. After a hearty breakfast of poached eggs, I spent some time catching up on blogging from the hotel lobby. Slowly the hotel came to life, with more attendees, fezzes and stetsons evident. 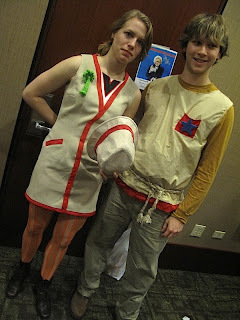 There were some great improvised costumes around, and I especially liked a group who were doing the Fifth Doctor TARDIS crew (see below). 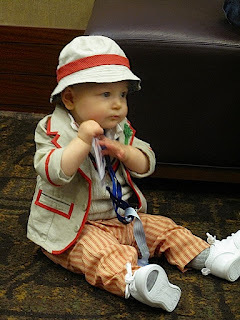 There is a lot of new-Who cosplay, so it’s refreshing to see some classic series costumes for a change, and even more so if they are worn by younger fans, proving the older episodes haven’t lost any of their appeal. Chicago TARDIS is nowhere near as big as Gallifrey One, with only around 800 people due to come this weekend. It is, however, well organised and put together with the experience of the fans in mind. This morning I went through the process of getting my photocall with the principle guests: Janet Fielding, Andrew Hayden-Smith and Peter Davison. I have a reserved ticket for the weekend, which gets me a place in the queue just after the All-Access attendees, but before the standard ticket holders. To minimise the standing in line queuing time, we are sat in a holding room until they queue is ready to start moving. We are than called and queue up in the order of our ticket numbers. It’s a simple but effective means of line management, without everyone having to stand around for hours on end. Pom is an affectionate derogatory term Australians use to refer to UK residents. What I do like about these photocalls over the other I have done is as well as having a professional photographer taking your picture, for a few dollars extra they will take a second shot with your own camera.Wonderful as the in-your-hand pictures can be, because they are printed at great speed they are often of poor quality with an unattractive colour cast over them. (That said, the prints I received here were a lot better than others I have had, so top marks to the organisers there). Next was the chance to get Andrew Hayden-Smith. I don’t think he has done many of these events yet, but he was very courteous and friendly. 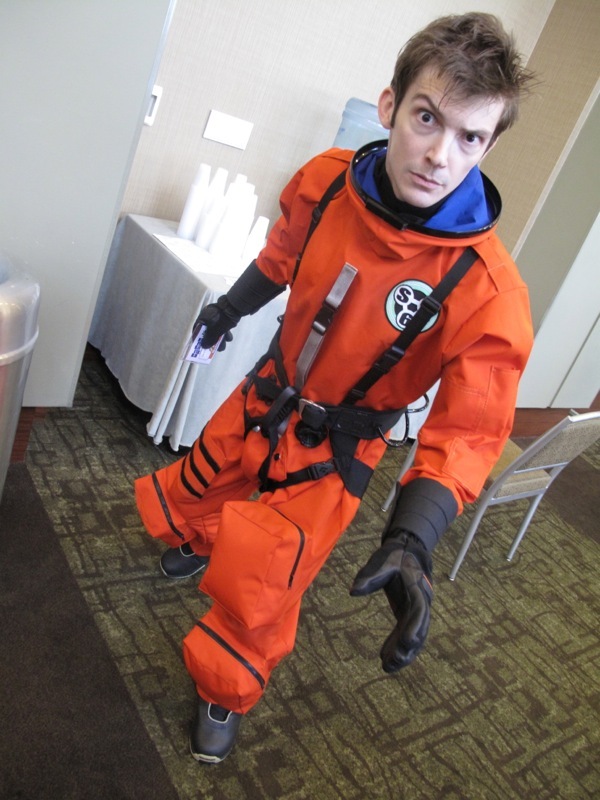 I have sometimes detected a slightly cautious reaction by some guest to fans as they approach, but Andrew was all smiles and has embraced the whole convention experience. Finally for today was Peter. For him I felt a costume change was in order! Knowing Peter was the headline guest, I had to bring the Planet Of Fire waistcoat along, which I wore with a shirt from a group buy from Gallifrey Base and a pair of my Five Trousers, season 21 pattern. Standing in line a got a lot of comments about my costume, and some dropped jaws when I told them it was the screen-used costume. I wasn’t sure if Peter would twig why I was wearing, but I could see him looking at me with a quizzical eye. 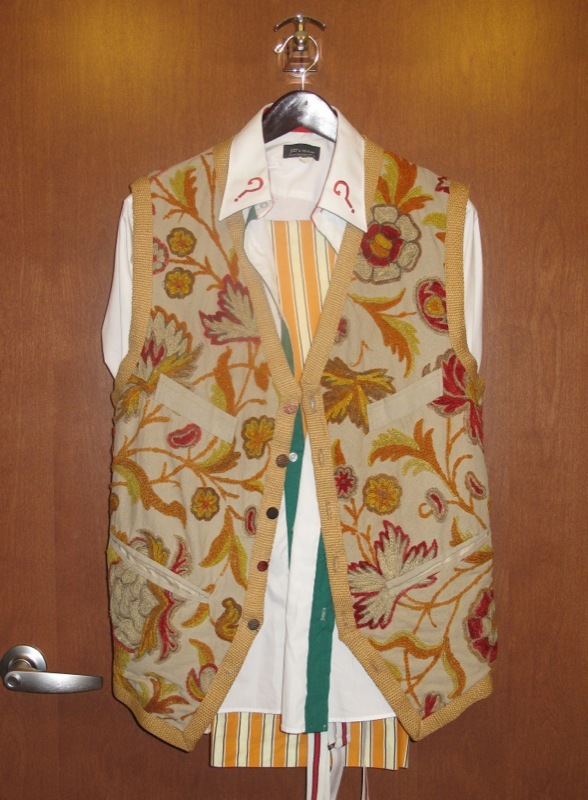 I explained this was his original waistcoat, and he acknowledged it, but said he didn’t specifically remember it that closely. Bit disappointing, but I guess you can’t expect him to be a walking encyclopaedia of his costumes. 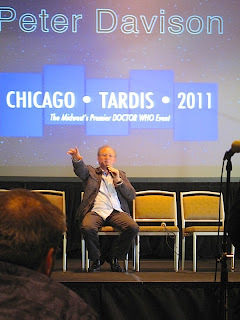 Next up was Peter Davison’s Q&A, or interrogation as I like to think of it. He’s a brave man to sit alone on a stage in front of a few hundred people with a seemingly never ending line of inquisitors waiting to ask their questions from the microphone in front of him. He showed great wit with his answers, and I could see a number of people in the audience prompting or leading him towards some of his well trodden tales of ribbing Matthew Waterhouse or Nicola Bryant’s cleavage! 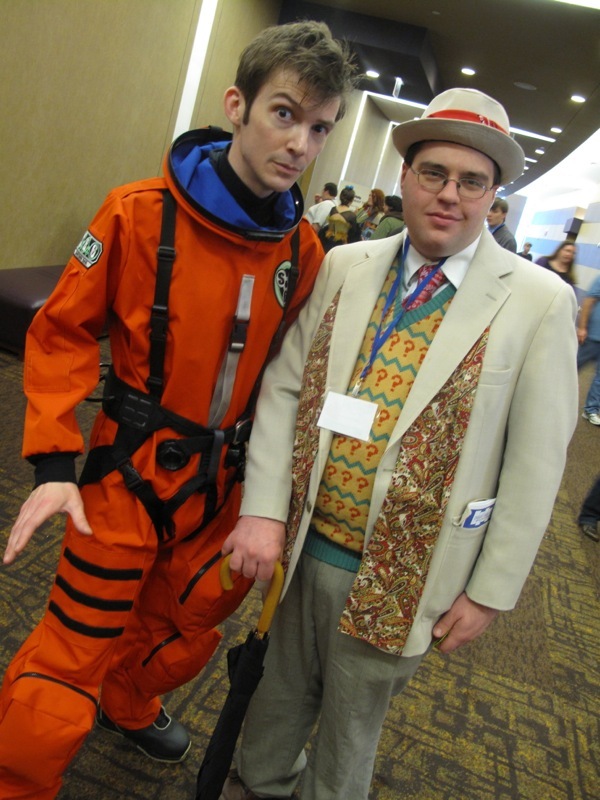 After lunch I was reunited with an old friend – The Ultimate Tennant Suit, and it’s owner, Kevin Coppa!! I knew Kevin was coming this weekend, and after scaring the life out of him by turning up at Gallifrey, I gave him some warning this time of my attendance. After chatting away to the small hours with friends last night, I’m up again bright and early to discover the news that although Sarah Sutton was forced to drop out due to a family illness, filling her place at short notice is Matthew Waterhouse! Knowing what Janet is like, I feel a little sorry for Matthew, though also some respect, cos it’s gonna be like lamb to the slaughter!! Heading back down in the lobby area I caught up with Kevin again, who was now in his second costume of the weekend, his Satan Pit spacesuit. He bought the suit from SpaceToys, who supplied the originals to Louise Page for use in the series, but found, as Louise had before him, that it required substantial reworking before it was wearable as it was quite shabbily made. To complete the outfit, he tracked down the correct gloves, climbing harness and boots. From here it was time to get ready for the big photocell of the weekend, with the Fifth Doctor TARDIS crew. Subscription to this was heavy, so I was thankful I opted for the Reserved ticket, which at least got to closer to the front of the line without any effort. The ONLY costume I could possibly wear for this was my Planet Of Fire waistcoat. When I was called forward to my photo, I could see Peter whispering side-ways to Janet and they both gave me a funny look. “What?”, I exclaimed. Peter then explained to Janet this was part of his original screen-worn costume, she looked surprised. Afterwards she asked how I acquired it, and I told her I bought it at auction. I then immediately grabbed my ticket to get the photo signed, before heading off to get some lunch – and make another costume change. My ticket number was for the autographs 44, so I thought it wouldn’t take too long to get my photo signed and I could then head off for pre-judging, but it still took a full hour before we were called from the comfort of the holding room to get in line. I quickly changed back into Maroon Six and dashed down to pre-juding to find I had missed nothing: they were running late. I guess they have done a lot of these events, so the organisation was good, though painfully slow. The MC speaks to us all in turn to check our names, special requirements and to make sure we are all happy. We then have our photographs taken for their records, before having the opportunity of a brief one-to-one session with the judges where you can explain the USP of your costume. As I took them through my work, I could see their jaws collectively dropping further and further. I think I made a good impression! Kevin was presenting his Space Suit and we chatted with an Idris while we waited to be moved up to the stage for our moment in the spotlight. Following the excitement of last night and winning the Masquerade award for Best In Show: Workmanship, I kick my day off by going to the Sunday Brunch with the guests. This was a ticket only affair and I luckily picked up entry to it earlier in the weekend. It was an interesting exercise in the different approaches the UK and US take to breakfast. I would never have fruit and fried food on the same plate; the bacon is sliced real thin, making it very brittle; the presentation of the pastries are very sickly-sweet – but hey – when in Roman! The guests entered the room, and dispersed to tables to sit with everyone. I have to say I didn’t enjoy the brunch at all. The company on my table, although nice, insisted on taking American politics throughout; we didn’t get a guest; and it cost $50 for a self-service, when I had been paying $20 for table-service previously. I didn’t stick around – I’d rather be off costume spotting. In the lobby I found some UNIT guys, both old and new keeping everyone in check. I had a particular interest in these military SWAT uniforms – but more on that soon . . . I do love the diversity of costumes that are worn at this event. They are not limited to the New-Who, with a lot of Classic-Who on show. I found a group straight out of The Hand Of Fear, as well as a great Seven and Ace. The attendance of Peter Davison naturally encouraged the Five cosplayers, and I found a number of Adrics, Tegans, Nissas and Fives, both male and femme! I went to see the Big Finish Q&A panel, with the Fifth Doctor TARDIS crew in tow. 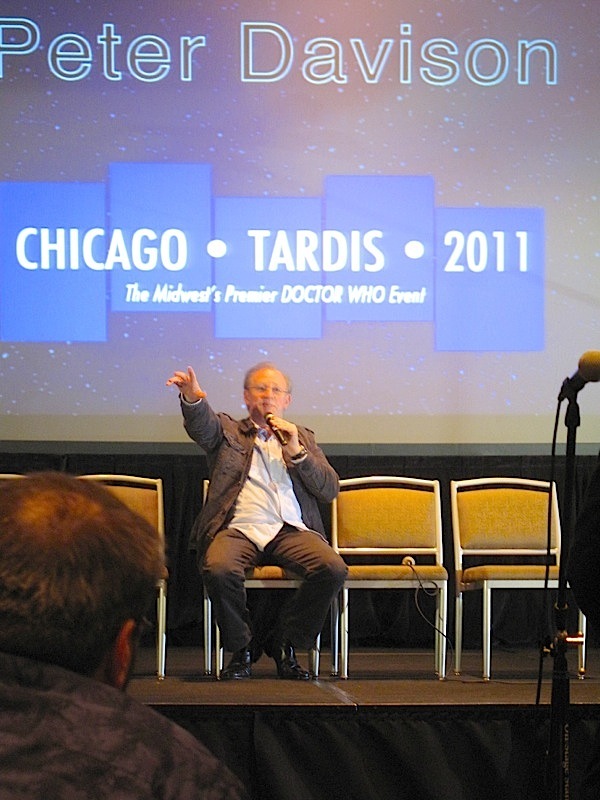 Nicholas Briggs was taking the lead, and getting frustrated when the questioning didn’t steer towards the Big Finish part of the Panel, instead asking about the time on the classic series. One amusingly worded question went, “I was listening to a Big Finish CD before watching a classic episode on tv, and wondered what your favourite scene to film was?” This had pleased Nicholas, until it swerved back to a classic series question! The Sunday of the convention starts to wind down rapidly after lunch, so following the final time the Fifth Doctor Crew appeared on stage, the halls and lobby were soon looking less populated than before. Looking back, it’s been a more low-key affair compared to Gallifrey One, but this has made it more intimate and personal. There may not have been the bombardment of guests that LA offer, but that meant you almost got to know those that were here a bit more, as they recognised people from photocalls to autograph sessions. I’ve thoroughly enjoyed the weekend meeting old and new friends – but it’s back to the grind of my sewing machines on Tuesday and do some serious catching up with my commissions . . .